One of two new NEX cameras launched mid September - the other being the recently reviewed Sony NEX-5R - the Sony NEX-6 slots in just below the range-topping Sony NEX-7. 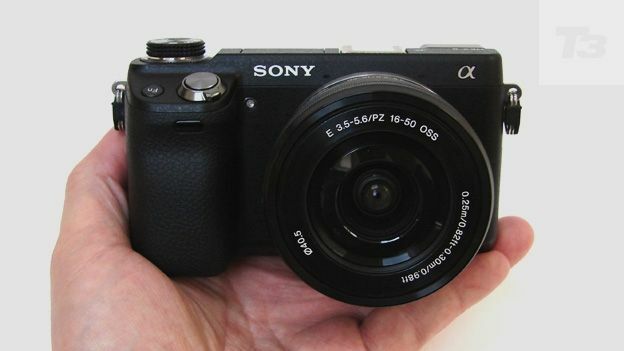 That was Sony's first compact system camera (CSC) to include an electronic viewfinder (EVF), thereby enticing existing Sony Alpha digital SLR owners looking for a smaller camera with a similar feature set and traditional handling. Like that NEX-7, the newer NEX-6 incorporates both EVF and vacant hotshoe for accessory flashgun, along with a feature recently found on the cheaper NEX-5R: a rear touch screen that can be angled up or tilted down for greater flexibility when composing shots. The NEX-6 is all about choice. This ethos is furthered by the fact that, like its little brother, the compact incorporates Wi-Fi, and Sony promises that it's rolling out a series of downloadable 'apps' via its Play Memories service with which camera users can personalise and customise their models. The idea is that you gradually 'build' the camera you want; though to be fair, from the very get go the NEX-6 looks impressive. Aimed at the enthusiast who likes plenty of control at their fingertips, the core of the Sony is a large APS-C sized sensor of the same proportions found in digital SLRs. The maximum stills resolution is respectable too at 16.1 megapixels, and, even if that does fall short of the 24.3MP afforded the pricier pro-grade NEX-7, it is comparable with most CSCs out there from the likes of Olympus and Panasonic. More direct competitors for this model include the Samsung NX1000, NX210 and NX20, which all likewise feature Wi-Fi and APS-C sensors. Sony sent us the NEX-6 kit that comes bundled with an optically image stabilised 16-50mm 'power zoom' - which means operation is mechanised via a sliding switch on the lens barrel itself, rather than the lens being adjusted by hand to zoom in or out, as is the case on most CSCs and DSLRs. Like the Panasonic power zooms in its competing 'X' series, providing an electronic mechanism that retracts the lens when not in use has resulted in a slimmer combined profile when screwed into place on the front of the Sony. Being marvels of miniaturisation, power zooms do currently command a slight premium however, and the bundle price for NEX-6 plus lens is £829 via its manufacturer. If you own an older NEX, or Alpha DSLR mount lenses and the necessary adapter, and therefore just want the body, that's a more affordable £709. If you don't feel the need for the electronic viewfinder, the NEX-5R is 'cheaper' still at £669 with 18-55mm zoom. So what else do we get for the NEX-6''s outlay, and is it worth your additional spend? With a matt black surface that mirrors that of a digital SLR, and, in spite of the more compact and minimalist design, the NEX-6 feels solid and well built when held in the palm, particularly with power zoom attached. The flat, boxy, seemingly Russian tractor factory approved design looks far less impressive without its lens. But the Sony steals the jump over the likes of the not too dissimilarly priced Canon EOS M by at least featuring a comfortably rounded handgrip with space for three fingers to enable a firm-ish hold. There's even a rather spindly pop-up flash sunk into the top plate, so an accessory flash isn't a total necessity. As with the NEX-7, Sony appears to have packed just about everything you could hope for from a compact system camera into the NEX-6, in terms of controls and function set. As we've mentioned, the NEX-6 is one of only a handful of CSCs to feature a built-in electronic viewfinder - or 'EVF' - which here comes with a nifty eye sensor that switches it on for you automatically. Deactivating the larger screen below in the process. This meant we weren't wasting precious seconds pushing buttons when lining up that potential shot of a lifetime. The EVF is comprised of a high-definition OLED screen too, for better contrast and deeper blacks, though if we've a slight grumble it's that the adjacent sensor could be even quicker to respond to the appearance of your eyeball. As it is, there's a slight wait just over a second or so for it to flick on. Rather than burying key controls away in a bizarre order on the on-screen menus, in the way that it did with the past two generations of Sony NEX compacts, the third generation NEX-6 gets a proper, robust, stiff-feel shooting mode dial featured prominently on its top plate. Here we get the chance to make manual adjustments via program, aperture priority, shutter priority and manual settings, along with intelligent auto and automatically image enhancing 'superior auto'. In addition there are the expected scene modes and Sony's Sweep Panorama option, which fires a quick burst of images as the user 'sweeps' the camera through the scene, automatically stitching them together into one seamless elongated image. As you turn this solid-feel dial, each selection clicking firmly into place, a virtual version with text explanations of each option can be viewed on the right of the rear panel LCD. In combining both hard keys with virtual equivalents, it really does feel like one of the most intuitive to use NEX models so far. A widescreen-ratio LCD monitor of the regulation three inches in size takes up approximately two thirds of the NEX-6's backplate. It offers not only intuitive touch screen operation, which we had long been waiting for Sony to introduce on the NEX, but can also be angled up or down. This adjustability enables the screen to still be viewed when attempting those otherwise tricky close to the floor shots, as well when the camera's hoisted up at arm's length over an obstruction. However, it cannot be flipped out parallel to the body and rotated as one might do with a camcorder's screen, so we can't shoot around corners with the NEX-6 just yet. But whichever way you use it a respectably high 921,600 dot resolution provides near pin-sharp clarity when lining up pictures and video, as well as when reviewing them. In fact it's easy to overlook the smaller EVF when the larger screen offers the greater flexibility. The Sony NEX-6 comes bundled with a NP-FW50 rechargeable lithium ion battery, which when fully charged is capable of delivering up to 360 shots; 30 pictures more than the same battery in the NEX-5, curiously. While that may not sound like masses compared with the 500 or so images delivered by a typical digital SLR for a similar cost, it's still almost 100 shots greater than most competing compact system cameras sub-£1000 can manage, and beats the better likes of Samsung's NX1000 which can manage 320 images from its own cell. So in respect of power consumption the NEX-6 makes a very fair fist of it. The battery sits in a compartment shared with a dual-use slot for either SD media cards or the Sony Memory Stick in the base of the NEX-6 handgrip. The fact that the NEX-6 comes bundled with a mechanised zoom, rather than say the manually operated 18-55mm that came with the NEX-5R, is a boon for those shooting video. Predictably, adjustments and transitions are smoother than most of us can manage when alternatively rotating the lens barrel by hand mid filming. While there is a slight mechanised buzz as the lens does its stuff, the fact that it can be operated by a single thumb resting on its slider control also avoids the built-in stereo microphones directly above the lens picking up unnecessary hand movements in quieter shooting environments. With the NEX-6 there is the regular Sony option of shooting at 50 frames per second for that more cinematic look when replayed, and still at maximum resolution 1920x1080 pixels. It goes without saying that the ability to tilt the screen - if not rotate it - still affords the user the opportunity to capture a greater variety of shots that would not possibly have been attempted via a fixed screen. In truth the flexibility of the screen is such that we found ourselves using this in the main rather than the smaller electronic viewfinder, but the latter is there for those who prefer the traditional shooting method of holding the camera up to their face. Image quality on NEX cameras has been excellent from the off, thanks in part to the APS-C sized sensor borrowed from digital SLRs, and so it is here, with the power zoom maintaining detail across the frame, even if familiar compact bugbears such as pixel fringing between areas of high contrast still rear their head. Having been playing with the Canon EOS M, just prior to using the NEX-6, we have a slight preference for the pin sharpness of its own kit lens and DSLR-like depth of field of the Canon's shots, but it's a close call. And certainly the built-in flash and EVF of the Sony offer more image taking options out of the box. The 16.1 megapixel effective resolution, APS-C sensor incorporating NEX-6 is a solidly built and solidly featured camera that comes with a price tag to match, that would otherwise buy you a very good mid-range digital SLR with much the same feature set. Albeit a DSLR with a bulkier frame that, unlike the NEX-6 when equipped with its 16-50mm lens, will not fit in a roomier jacket pocket. Now the NEX-6 is on the scene there seems little point in spending more on an NEX-7, unless you really are going to be printing images out poster sized, and so eight million more pixels of stills resolution isn't going to make all that much difference to you. There is not much that lets this camera down, which is a rare thing to say, save for a rather bland boxy design that is true of the NEX range as a whole. Those who are swayed by such things may prefer the look of the latest trio of cameras in the Samsung NX range, which offer a slightly higher 20.3 megapixels resolution from the same sized APS-C sensor plus Wi-Fi connectivity, along with excellent image quality. There's also the newer Canon ESO M, which offers a large sensor and a slightly smaller form factor, but omits a built-in flash and Wi-Fi. So, a few choices for potential owners of the NEX-6 worth investigating before parting with your cash. For owners of first generation NEX models, upgrading to an NEX-6 is a no brainer however, while the lure for owners of Alpha series DSLRs wanting a smaller second camera that they can use with the same lenses - via optional adapter - is also going to be strong. If you can stomach the price, and overlook the purely functional design, then the NEX-6 is a winner.